#5 on Reader Marilyn's list of vital issues: blurbs. The blurb that sells your book to the reader should be short – a few hundred words, no more than one page. It should be clear and concise. It's a teaser, and it should tease, draw the reader in, make her click that Buy button so she can read more. * Don't fill your blurb space with quotes from average readers. Endorsements have to mean something, or they're a waste of my time. If Tami Hoag or Lisa Gardner or Jayne Ann Krentz says it's a great book, I'm more likely to pay attention. But "Ann Q says it's the best book ever written" doesn't impress me. It makes me wonder who the heck is Ann Q. The author's best friend? Her mother? Is she even a real person, or a pseudonym for the author? If she's an author, then please clarify that: Ann Q, author of . . .
For the friends and family who love your book, let them post reviews, not endorsements. * Don't make extravagant comparisons. "It's Gone With the Wind for a modern generation." "The magic of Harry Potter mingled with the sensuality of Eclipse." "If you liked 50 Shades of Grey, you'll love my book." (Frankly, thinking of all the Harry Potter kids and sensuality gives me a little of an ick feeling.) Granted, someone is out there right now writing the next multi-million bestseller . . . but it's a sure bet they won't be wasting blurb space trumpeting their own greatness. Leave the hype to your readers. * Don't fail to proofread your blurb, then do it again. I've already talked about my yearning for technically correct writing. If you have four typos in your blurb, it's a sure bet that this reader, at least, isn't going anywhere near the Buy button in her haste to get off your page. * Don't forget to tell what your story is about. Honestly, I came across this problem multiple times in a recent marathon Kindle ramble. Blurbs that talked about the author, that mentioned their families and their pets, that gave backstory on the characters, that talked about everything except what the book was about. Unless I know the author's work and love it, I'm not going to buy a book without knowing its subject. * On the other hand, don't tell too much story. I honestly don't want to wade through three pages of blurb, not even when I'm leisurely shopping (and especially if there aren't any paragraph breaks). I rarely have time for leisurely shopping. When I go looking for something to read, I want it now, or at least in five minutes. Think of the blurb as your 30-second pitch to sell your book. Read back-cover blurbs on traditionally published books. Read them on other indie books. Write your own. Send it to every reading person you know for critique. Write it again. And again. It's your biggest opportunity to persuade the reader to buy your book. Use it to the best of your ability. All these items I've talked about in the last five posts – covers, formatting, editing, copy editing and blurbing – are all things that a publisher would do for you if you traditionally published your books. But since you're indie publishing, you are the publisher. All this stuff is your responsibility, in addition to writing the book. It's big job, but your book deserves the best chance you can give it, and so do your readers. Yep, the reader in me is still talking about issues that can make or break an indie-published book for her. #4 on the list of vital matters: copy editing. I am not so fond of my copy editors as I am my editors. I've had some great ones; I've had some not so great ones. But they're still necessary. Here is my hard-and-fast, never-bend, never-break rule number one for any kind of publishing: Words should be spelled properly, sentences should be punctuated properly, and words should be used properly. We are writers. Words are our stock in trade. At the very least, we owe it to our readers to know how to spell them, punctuate and use them. Can you imagine a surgeon who doesn't bother to learn how to use a scalpel or saw? A cashier who can ring up your order but can't make change? A bus driver who's great with Drive and Reverse but hasn't figured out Stop? I believe it's fair to say that Americans' ability to spell and punctuate has gone downhill over the last three generations, particularly with the popularity of the Internet. Sloppiness rules. Can't spell a word? Close is good enough. The biggest English nerd in the world can't diagram the messes that pass for your sentences? oh well, lol. When you want to have a career as a professional writer, close is not good enough. LOL doesn't cut it. You need to know all that boring stuff you turned out in school about sentence structure, grammar, spelling, etc. And if you won't or can't learn it yourself, you need someone who does know it: a copy editor. Don't assume because you don't know where the commas go, your readers don't, either. A lot of us do. A lot of us know that carpicious and capacious aren't interchangeable. A lot of us know that as a general rule, sentences require nouns and verbs and action and that there are standard forms for their structure. And a lot of us are getting really tired of reading books where the author didn't care enough to present us with her absolute best work. Google copy editors with a body of work to back up their claiming the title. Hire a retired persnickety English or compostion teacher. Memorize Strunk & White. Clean up that book before you publish it. Number 2 on things that affect me as an indie reader: formatting. Obviously I've never formatted anything to be indie-published, but I know people who have. I know there are people who will do it for a modest fee (or an exorbitant one), and there are programs that will do it. If you can't figure it out yourself, get help somewhere. When I read a book, I want great characters and a great story, sure. I want writing that entertains me and keeps me hitting the page button. But I also have certain expectations of professionalism. I've read tens of thousands of print books, single spaced with consistent margins, paragraphs indented, quotation marks and em dashes where they belong, chapter headings consistent. To me, that is the standard of publishing, so I expect it from all books. Most of all, I want consistency. If you choose not to indent your paragraphs but to put an extra blank line between them, okay but do it that way on every page. Don't indent here, skip it there, then indent it over on that page. And don't fail to indent without that blank line between paragraphs. It makes each chapter read like one great big paragraph and it's hard to follow. Don't give your reader even one small reason to put your book down and never come back to it. Make it as easy for them to read as possible. With italics, again I want consistency. Some authors use them, some underline, some will bold and some will use all capitals for emphasis. While I hate seeing all caps, I can live with them. I can live with anything as long as it's consistent. A table of contents is necessary in digital books. When I sit down to read, I want to concentrate on the story, not try to figure out how to get from here to there and back again. Confession time: I'm an end-of-the-book reader. I'll read a chapter or two, then flip to the end and read the last chapter or two. Make it easy for me to get back to where I was. I'm also a bio reader. After I read a few pages of Chapter 1, I get curious about the author and jump to the bio. Again, make it easy for me to return to where I left off. One thing that drives me crazy mad: when the book's flowing along just fine, then suddenly the left margin jumps over a couple inches so that you've got basically one half-width column running down the right-hand side of the screen. I'm sure it's some coding mistake, which we all get. Just don't live with it, or expect your reader to. Fix it. There are so many things out there demanding a reader's time. Don't give her an excuse to turn to something else because you didn't get your book formatted properly. Last time I talked about my own short-lived experience with indie publishing. Just to confirm, what I'm talking about now is not from the perspective of an author but of a reader with some knowledge of how the publishing world works. I bought my Kindle two years ago when I was rehabbing after a total knee replacement. The discovery of easy-to-get books, some even free, was like an unending stream of booze to a wino. I downloaded them by the dozen and read them the same way. I found some authors I adore; I found others whose books, sadly, weren't ready for publication. I continue to read a lot of indie books, and I've made some observations about what does and doesn't work for me as a reader. Today it's covers. I understand most people don't make a lot of money from their indie books, but like the old adage says, you've gotta spend money to make money. Covers have always been the first or second attention grabber for me (tied with titles). Whether in print or electronic, a cover can make me look twice at a book or it can turn me off one. If it's in print, I may go ahead and pick up a book with a really bad cover to read the back blurb. If the blurb is interesting, or if I'm familiar with the author, I may buy the book anyway. If it's electronic, unless the title really, truly intrigues me or I know the author, I won't go any farther. It's way too easy to skip to the next one on the list. I know authors who've gotten great covers for $15 – 200. Professional covers. Covers that give you a feel for the book. Don't use your son's/niece's/friend's art unless they are really talented artists. You can put together your own cover with stock art, but don't just toss something on a page and publish it. You're a writer; odds are, you know other writers. Get input. Print out a mockup and show it to reader friends. Be selective with fonts and colors. If you have to, print out a dozen different versions and stop strangers in bookstores for their opinion. My least favorite cover ever wasn't on a digital book, but from a small press with a hero and heroine who looked like plastic toys that melted and reformed in strange humanoid shapes. I have to say, I picked up the book because of the horrid cover. I had great sympathy for the author, because even a book full of blank pages deserved a better cover than that. Last fall I decided to put my first single-title romantic suspense, In Sinful Harmony, on Kindle. The book came out in 1995 and was over 150,000 words. I knew that to start, I would have to do some serious editing, even though the original got great reviews. Longer was okay then. Tighter is more the game now. As I worked on cutting and revising the first chapters of the manuscript, I came to a realization: while I loved the book for what it was in its time, and while it was the best book I could write then, it wasn't what I wanted out there under my name today as a new reissue. My style has changed over the years. My readership has changed. There was a steamier edge, a crudeness, to the book that didn't set well with me now. While many of my readers have stuck with me since In Sinful Harmony came out, many have joined me after, and I can't honestly say this book would appeal to them. It wasn't something I was willing to put out again without a tremendous amount of work – totally rewriting it, in fact, and that didn't seem fair to the book itself. For its time, it's a great book. It fitted perfectly into its market in the mid-90s. It would probably still fit with a lot of people, but not so much the audience for my current books. So I set it aside. I may go back someday and indie-publish it as is. After all, it was published by a major New York house, it had a great editor and copy editor, and maybe some readers who feel nostalgic for the old books will find it and love it. But for right now, it's staying on my computer. 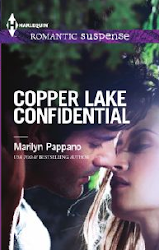 By the time this posts, I will be finished with Copper Lake Confidential, my Harlequin Romantic Suspense for next spring, but right now I'm in the final stages. Some call it the black moment -- where everything seems lost or the villain makes his big move or the hero/heroine are in a life-and-death situation. I call it the word-count count-down. At the moment, I've got approximately 3000 words left before I reach the desired length. Unfortunately, I've got about 6000 words of story left to tell. You'd think after all these years I'd have a better sense of fitting story into words allotted, but this happens every time. And it's never the other way -- not enough story for the limit. I am almost always over. If you've ever talked to me, this won't be a surprise. Why say in five words what I can say in twenty-five? I will have figured it out within the next 36 hours. It'll still be a tad long, but I'll keep it to just a tad. I just wish that once a story would pace itself out so that I can avoid the word-count count-down. Romances, especially category romances, are unfairly characterized as formulaic. Sure, boy meets girl, boy loses girl, boy wins back girl, they live happily ever after. Of course they do -- that's what makes a book a romance novel. A mystery wouldn't be a mystery if there wasn't a puzzle to solve, and a science fictin novel wouldn't be science fiction if it didn't take place in a different universe/time/space. One place that category romances do have a formula is in word count. The books are published as series, so all the titles in a particular line, such as Harlequin Romantic Suspense, are roughly the same length. But to people who point that out as a negative, I'd just like to say this: try to write a book that includes a romance and a suspense plot and do it all so the reader is totally satisfied when s/he finishes and within a proscribed length. With an unlimited word count, you can meander your way to the end (if your editor will let you, and if she will, the reader probably won't, unless your writing is so lyrical that they don't care you're meandering). But when you have limited words to tell your story, every one has to count. Closing the door has to do with protecting your work while it's still in the creative stages. The theory is you start writing Chapter 1, you do it more or less in private. You don't trot out your still-forming baby for inspection by anybody -- not your agent, not your spouse, not your editor, not your biggest fan. It's just you and your computer and that story you're wrestling into shape. Granted, there are as many ways to write as there are writers and each of us has to find the right way for us, but I think a lot of people could benefit from a closed door. Sure, a new writer has to find out whether she's on the right track, if the story's staying clean and not getting its nose snotty, if its style is cool or out of date or just plain boring. You have to protect your story, your voice, your vision of what you're creating. It's yours. It's coming out of your passion and courage and that gnawing need to get it out of your head and hopefully into someone else's. Don't give anyone, however well-intentioned, the chance to sidetrack or derail you completely until you're at the point as a writer that you can stand up for your creation. Agent Maria Carvainis told me many years ago that authors are the most egotistical people she knows -- the most insecure. And for most of us, she's right on target. Think about it: it takes a whole lot of confidence for someone who's never written a book to decide that a) they can do it, b) someone will want to read it, and c) they can make money with it. If writing wasn't a passion, if they didn't believe in their stories and themselves, they would never start. So they pen the next great American novel, and sooner or later they let someone read it: a relative, a friend, a critique partner, an agent or an editor. Generally, then comes the rude awakening. That great novel turns out to be nothing but a semi-coherent mishmash of stuff that no one who doesn't love her dearly wants to read. It can be devastating. I cried for two days when I got my first rejection. I swore I would never write again. I thought I had talent, and the editor ended her less-than-glowing letter with "don't bother me again." It's a balancing act -- that ego sweetly whispering in your ear, "You're the best ever," and that insecurity curled in a ball in the corner of your brain shrieking, "You can't do this! It was a fluke! They'll find out you're a fraud!" But, in my never-humble opinion, it's the best gig out there. I love my editors. Did you get that from Wednesday's post? I've learned a lot from my CEs over the years. And one of the things I learned is that they're not always right. I had such an experience with a CE years ago on a romantic suspense novel in which she wrote me a two-page letter explaining why my entire story failed because it was hinged on my misunderstanding of the Constitution and suggesting ways in which I could fix it to make it at least slightly believable. Of course, first thing I did was panic. Rewrite the entire book? At that late stage in the process? Next, when I could breathe again, I called my editor and said, "My legal information comes from my husband (who's got many years of city, county and federal law enforcement experience under his belt), the local district attorney and the Attorney General for the state where the book takes place." There was a moment's silence, then my editor asked, "What are you talking about?" She didn't know the CE had sent the letter. She was not happy about it. There have been other bobbles -- one CE who wanted my Oklahoma granny who dropped out of school in eighth grade to speak the Queen's English, one who thought it sounded better to say that Dallas is a hundred miles closer to Houston than it actually is -- but mostly I've had good CEs. And truthfully, I'd make a lousy editor. I get too caught up in the story to worry much about the big picture. I disagree that anyone can edit themselves as well as a professional editor. We're too close to the story. We've worked too hard to write those words, describe those settings, come up with that witty dialogue. What we see as clever and cute and endearing, editors can see for the annoyance it becomes to the reader. They can spot the plot holes and the inconsistencies and the clumsy repetitions. Editors can make a so-so book into one well worth reading (to say nothing of buying). I've been blessed to work with wonderful editors. Leslie Wainger, who bought my very first book and taught me so much. Jeanne Tiedge, Claire Zion (who said an editor's job is to make the book better, not different), Beth DeGuzman, Melissa Jeglinski (who's now my wonderful agent). Wendy McCurdy, Patience Smith, Shana Smith (my current Harlequin editor) and Selina McLemore (who's editing the Tuesday Night Margarita Club books). I've been published for more than 25 years, and most of the responsibility goes to them.